The dust storm has knocked NASA's Opportunity rover offline for want of sunlight. The agency's nuclear-powered Curiosity, meanwhile, is snapping photos of the ever-darkening Martian sky. The two rovers are on opposite sides of Mars. "The Martian dust storm has grown in size and is now officially a 'planet-encircling' (or 'global') dust event," NASA officials said in a statement. The last dust storm on Mars to go global occurred in 2007, five years before the Curiosity rover landed at its Gale Crater site, according to officials with NASA's Jet Propulsion Laboratory (JPL) in Pasadena, California. The Opportunity rover has been exploring the plains of Meridiani Planum on the opposite side of Mars since 2004. During that 2007 Martian dust storm, NASA also lost contact with Opportunity for days due to low power levels from the lack of sunlight. 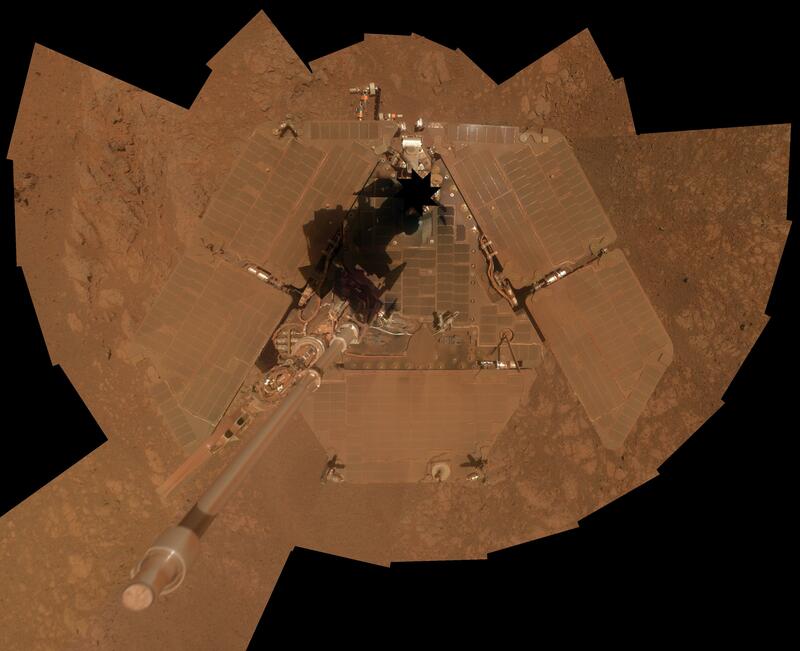 NASA lost contact with Opportunity last week when it missed a check-in call on June 12. NASA engineers think the rover is in a low-power mode, waking up only periodically to check if its batteries have recharged enough to phone home. All science operations by the rover are suspended while it waits out the storm. "A recent analysis of the rover's long-term survivability in Mars' extreme cold suggests Opportunity's electronics and batteries can stay warm enough to function," NASA officials wrote in a separate update Wednesday. "Regardless, the project doesn's expect to hear back from Opportunity until the skies begin to clear over the rover. That doesn's stop them from listening for the rover every day." The Martian dust storm was first detected on May 30 by NASA's Mars Reconnaissance Orbiter. Once it was clear that the storm would impact Opportunity, the rover was ordered into a sort of survival mode. A series of photos by Opportunity before it went silent show the Martian sky darkening until the sun itself disappears from view. Scientists measure the amount of sunlight-blocking haze in the Martian atmosphere as "tau," with the current tau at Curiosity's Gale Crater site reaching above 8.0, JPL officials said in the NASA statement. The last tau for Opportunity's site was over 11. The atmosphere is so thick with dust, "accurate measurements are no longer possible for Mars' oldest active rover." This series of simulated Mars rover Opportunity images shows how conditions have changed around the NASA rover as a huge dust storm has intensified (from left to right) throughout June 2018. According to NASA, the 2018 dust storm is not as big as the 2007 dust storm that Opportunity survived 11 years ago. It's more similar to a dust storm seen by the Viking 1 lander in 1977. Past dust storms seen by NASA's Mariner 9 spacecraft from 1971 to 1972, as well as by the Mars Global Surveyor in 2001, were also much larger. During those storms, only the tallest volcanoes on Mars were visible poking above the dust. "The current dust storm is more diffuse and patchy; it's anyone's guess how it will further develop, but it shows no sign of clearing," NASA officials wrote in the second update. NASA scientists are maintaining a full-court press on the Martian dust storm. In addition to Curiosity's weather observations on the surface, NASA has several other spacecraft tracking the storm from orbit: the Mars Reconnaissance Orbiter, Mars Odyssey and MAVEN (Mars Atmosphere and Volatile Evolution Mission) studying the Martian atmosphere. The European Space Agency also has two spacecraft in orbit (Mars Express and the ExoMars Trace Gas Orbiter). India's Mars Orbiter Mission spacecraft is also in orbit. A key question for scientists is why some dust storms on Mars become planet-enshrouding events and last months while others fade away in a week. "We don't have any good idea," Scott Guzewich, an atmospheric scientist at NASA's Goddard Space Flight Center in Greenbelt, Maryland, said in the statement. Guzewich is leading the Curiosity rover's dust storm work. New photos from Curiosity show a wall of haze over Gale Crater that is up to eight times thicker than normal for this time on Mars, NASA officials said. One photo also shows a curious lack of shadows. That's because the entire sky on Mars is red and illuminating the rocks from all sides, NASA officials explained. While the dust storm won't affect Curiosity's power levels, the low-light conditions are forcing the rover to take longer exposures when it snaps photographs, NASA officials said. When Curiosity is not taking pictures, the rover rotates its mast-mounted Mastcam camera to face the ground, to protect it from blowing dust, they added.